A luxuriously foodie gift for the true gourmet presented in a traditional wooden hamper. 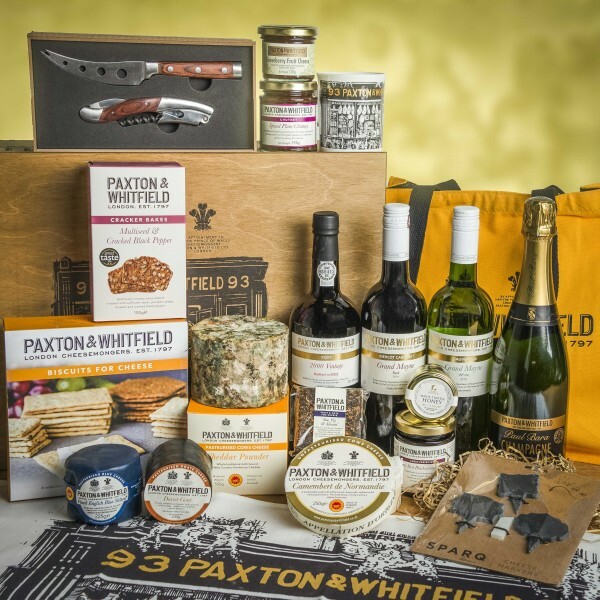 An exquisite array of Paxton & Whitfield cheese, with all the accompaniments, five bottles of Paxton & Whitfield wine and stylish, contemporary accessories, all presented in a wooden hamper box. Empty wooden hamper box with a Paxton & Whitfield embossed lid. Perfect for creating your own bespoke hamper. Dimensions of the hamper with lid on: 51cm length, 36cm width, 21.5cm height. This dry and balanced Champagne has been aged in the bottle for at least 3 years. The Pinot Noir grapes account for much of the blend giving great depth and fullness. Only available to customers aged 18 and over. TruffleHunter White Truffle Honey is made to their own recipe in the Cotswolds. They use the finest honey, infused with premium Italian White Spring Truffles (T. Borchii) and their own White Truffle Flavour. A vibrant wine with plenty of exotic fruit aromas and a soft round palate that finishes with a lovely zingy freshness. Drink on its own as an aperitif or with cheese. Only available to customers aged 18 and over. This new cheese is being made on an estate nestled between the Dorset Downs and the West Dorset heritage coast for Paxton & Whitfield using 100% goats’ milk. A great accompaniment for cheese, this dark, rich and fruity plum chutney is made with plums sourced from the Lake District and is flavoured with a selection of warm spices.